Adventures in Cardboard: Clayton Doesn’t Quite Win A Tournament But Comes Rather Close. The professionals to the left. The first-timers to this journey down the rabbit hole on your right. To battle through all the way to the end and then fall at the last hurdle must be the most cruel, no matter what the endeavour. Even if this endeavour is a card game that sometimes gets taken a little too seriously for its own good. Prior to this tournament, I had to play a separate qualifying event, racking up just enough to wins to merely sneak in to be able to play. Fast forward a fortnight, that seemed quite agonizingly slow- in truth I just wanted to get it over and done with, expecting to be torn to shreds, and leave me to enjoy a break from Magic: The Gathering. Elsewhere, 3,000 kilometres away, two Aussie rules football teams battle one another for the Grand Final. But then I care very little for that kind of football anyway (The round one, on the other hand, sign me up!). To start the day off, I got paired against Ciaran, decked in an Eagles guernsey ready to do battle with a Red/Green/Blue Energy deck that has become all too common in the tournament metagame. The first round was a tight battle but eventually he was able to stick a couple of a Bristling Hydra and a Glorybringer dragon that I knew I had no answer for, so I immediately packed up all my cards and moved on to the second game, opting to sideboard aggressively. In the event, I played my things, and my opponent got stuck on a two lands for a very long time and I won in short order. In the third, decisive game, I had to keep a hand full of lands and my own Glorybringer, and was punished for it and I wasn’t able to draw anything that could help me win the game. To begin the day with a loss meant I had an uphill battle for the rest of the day. Fortunately I was given a bye round, which meant a longer time to get lunch. At any given Magic tournament, nutrition is the no.1 key to success- and the best kind of meal is anything packed with proteins, either in healthy forms (please let me know what these are), or more often than not, in unhealthy ones. Two pizza breads from the nearby Baker’s Delight, and I’m ready for round number three. In the third round, I was paired against Ben, who doesn’t play the Standard format much, and it showed as I ran my Vehicles deck into a highly favourable matchup against a control deck. He draws nothing important and was forced to tap out for a board wipe the one creature in my field out of desperation. I win two back to back in the space of five minutes. The fourth round was against another Energy deck, piloted by Michael, nearly the same as the first match, with some differences in technology (in this context technology means specific card choices that line up well against the other decks in the metagame). The very first game, I come rushing out of the gates and put such a fast pressure, with flying planes to keep pushing damage past. In the second game, siding into a much more slower, controlling gameplan, my opponent floods out and I eventually grind him out the game with overwhelming board presence. After the fourth round, everyone took a look at the standings. Usually what happens here is that the top players look at the standings and do a little mental calculation if they could all just intentionally draw their games together to freeze out. However in this case, everyone had to play, since I and another were unwilling to risk losing out on being the top 4. So the final, decisive, intense fell down to a match between Red/White/Black Vehicles vs Mono-Red Eldrazi, piloted by Armayne, who in his spare time alters cards (Card altering is where you superimpose a new image, or paint over the existing card), a matchup that I had in no way expected to be playing against, and was utterly dreading knowing that its faster little brother, Mono-Red Aggro, was the one deck I could lose to. I play out the first game, bringing Armayne down to 3, but then my opponent launched a massive counterattack that brought me down in 2 turns. I go aggressive on the second game, and this time I was just fast enough to bring it to a third game. The pressure is on for both me and my opponent, and the audience behind me got treated to a spectacle of a duel between a Chandra, Torch of Defiance planeswalker on both ends of the table. In the event I won the duel decisively and barely just making it through, putting me in the top 4 at the expense of my opponent, who had played well despite the outcome. The finest magicians of the North- (L-R): Josh, Ciaran, Logan, some random nobody. 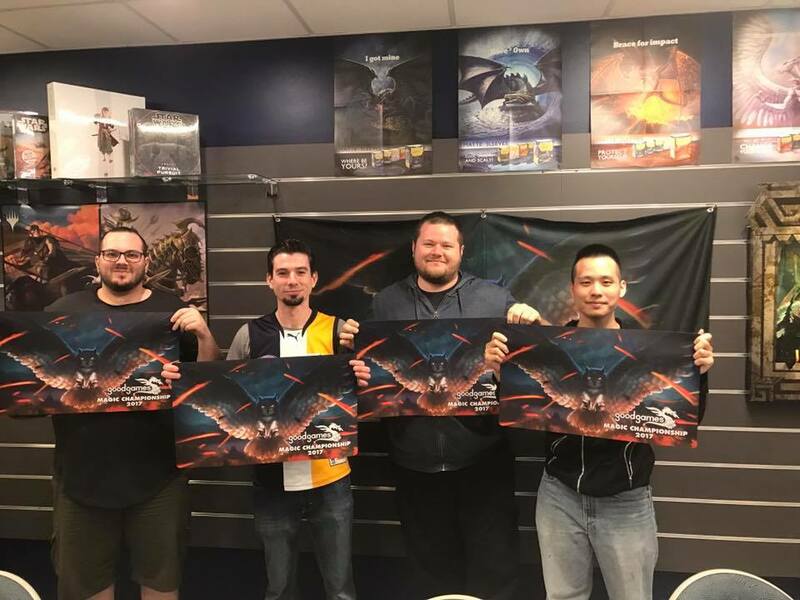 There was a brief moment of respite and celebration was given to the top 4 players- we got the official Good Games Magic Championship 2017 playmat (painted by frequent MTG artist Ryan Yee), and the right to represent the North in heading South at Cannington, in a winner-takes-all event. The first elimination round was against Josh, who was once again on Energy. The first match ended in a typical victory I got to sequence perfectly. The second match however dragged on as both of us drew land after land after land, meanwhile an earlier Doomfall spell allowed me to know the entire contents of his hand, and had to bait out one of his counterspells in order to resolve a Gideon / Chandra (tournament was a weekend ago, exact details are sketchy) I had in hand, but in the event, it was Josh who made a play mistake as he removed one of my creautres instead of stealing it, and would’ve had a way to clear my Gideon. Not aware that he had made such a mistake, I cleared his last blocker and turned the Gideon sideways for lethal. Tense. 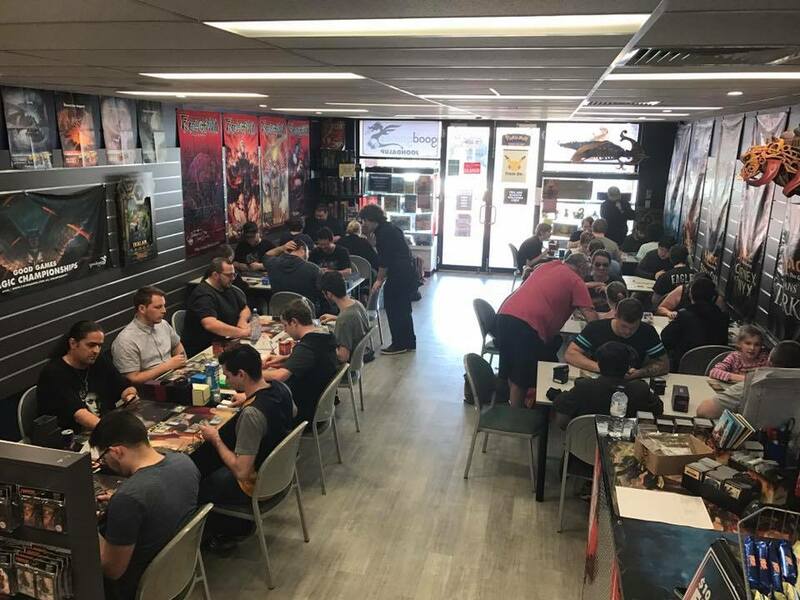 Before the final match, both me and Ciaran took a deep breath (and in his case, a durry), and played out the last round- to determine who wins a year of getting to play at the local shop for free. The first two rounds went exactly the way it did in the morning, but at the last hurdle it was a neck and a neck battle, and it came down to me missing crucial triggers (no-takebacks! ), and poor decision making. I block a small attacker with Archangel Avacyn. Then Ciaran dropped a Skysovereign, Consul Flagship to destroy the angel, and from there all hope was lost as I proceeded to draw Gideon, Ally of Zendikar, on the turn I needed a boardwipe of my own. At least he won a final of his own, unlike hos footy team. Ciaran got to put his name as the store’s first Magic: The Gathering champion (the narcissist in me wanted my name on that plaque). I had to settle for second-place prizes and it was a bit of a tough pill to swallow. 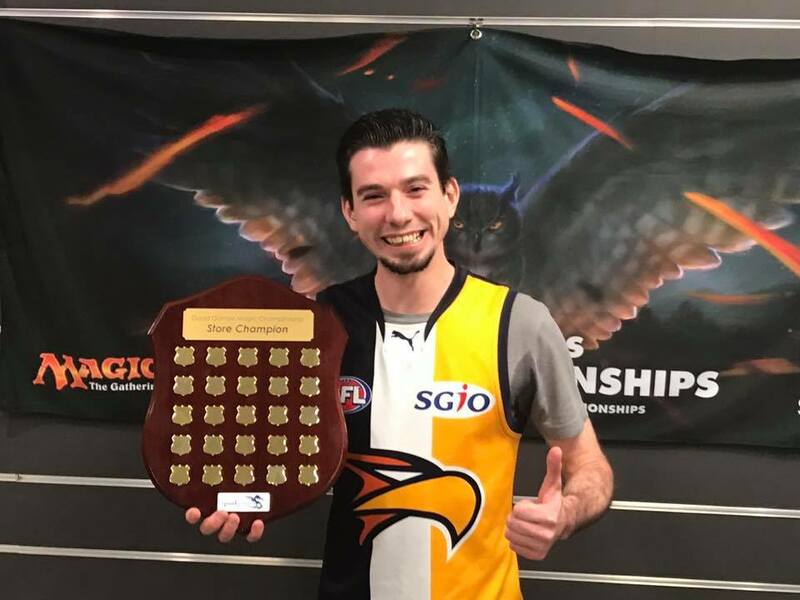 In three weeks time, I’ll have to make the journey down to Cannington and play for the one big prize (whilst possibly being livestreamed)- to be flown to Melbourne to compete against the other State Champions at PAX Australia (the biggest gaming/technology conventions this side of the hemisphere), on the October 27-29. If I do make it there, I’d like to hopefully flown in a week or two earlier to visit Melbourne’s vaunted cultural hotspots before I go into the arena.